Hurricane Harvey caused some production challenges for the three-part series, which stars a former NFL star and a rapper. 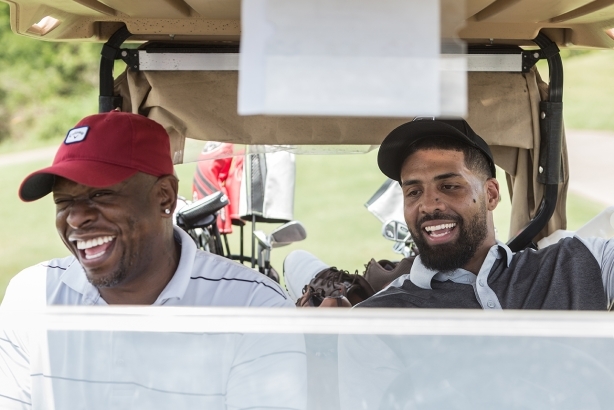 To attract new fans, golf equipment company Callaway Golf created a docu-series featuring two unexpected golf lovers: former NFL star Arian Foster and rap legend Scarface. The series includes both Foster and Scarface receiving a custom set of clubs from the brand leading up to a face-off on the course. Callaway and its digital AOR, The Kimba Group, began planning for the campaign in May 2017. "Golf personalities are typically pros, but we really wanted to show that unexpected personalities and people who aren't pros love the game of golf," explained Rebecca Rosoff, cofounder and managing partner at The Kimba Group. "With this campaign, we wanted the sport to feel more inclusive and unexpected and different." The idea was to create a campaign that followed up on a standalone video the brand had produced on Scarface and his love of golf in 2016. The campaign team looked to bring on Foster to set up a showdown on the golf course with Scarface, while also producing an authentic storytelling experience of two celebrities most people wouldn't associate with golf. "I think both Scarface and [Foster] were the perfect personalities to bring this to life," said Rosoff. "There is a lot of contrast between them, but also a lot overlap because they are both interested in music and they both live in Houston." Callaway brought on Vice Media to help produce the short series. Callaway had previously worked with Vice Media on several other projects covering the lives and experiences of pro golfers. Callaway's in-house web team designed a microsite to house campaign content. The campaign team also wanted to use the Callaway Create platform, which features photographers, animators, videographers, illustrators, and other artists who develop content for the brand, to leverage additional media for the campaign. Pre-production of the videos began in June 2017, with filming taking place between July and August. Sports videographer and producer Sarah Rinaldi directed the series. But Hurricane Harvey hit Houston in August, causing major challenges for the campaign. "The storm essentially obliterated both of [Scarface and Foster's] homes, which actually forced us to hold the campaign for about a month," said Rosoff. On October 9, Callaway published a video to its YouTube page featuring Foster being custom fitted for a new set of Callaway clubs, as well as appearing on the brand's podcast The Fitting Room. "The main goal of the campaign was to bring people into the Callaway universe and allow them access to the company, and that's the people, the products and the personality of the brand, and it do it effectively through a first-person POV profile," added Rosoff. "We supported the series with paid buys on Facebook, Instagram, YouTube, Roku, Golf Digest, and a few others," said Rosoff. The third and final video of the docu-series, Arian Foster vs. Scarface, debuted on the brand's YouTube page on October 16. On October 24, Callaway also released a video produced by Claymation artist AZXD, featuring a humorous interpretation of a real-life exchange between Foster and Scarface on the golf course. This element, as well as the other campaign content, was supported by short-form content shared on the brand's social channels. "You got your card swiper with you?" ?? In addition, the brand tapped urban artist, Justin BUA, who did a painting for the campaign. The painting is being sold as a poster through December, proceeds of which will go to the Arian Foster Family Foundation and support Hurricane Harvey relief efforts. The Golf Lives videos have received more than 7 million views across all social platforms and Roku. The campaign also created a buzz on social, with the brand generating 85,000 reactions, measured via comments, click-throughs, likes, favorites, and retweets. The campaign's microsite has seen nearly 50,000 visits, with visitors spending an average time of 13 minutes and 52 seconds on the site.